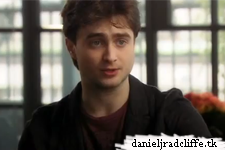 Well well after Horns more movie news from Daniel! Variety.com is now reporting that Daniel will star in The F Word, a romantic comedy which title refers to the dreaded "friend" zone and is based on the play "Toothpaste and Cigars" by T.J. Dawe and Michael Rinaldi. Michael Dowse is set to direct & David Gross and Jesse Shapira of No Trace Camping will produce along with Marc Stephenson and Hartley Gorenstein. Dowse and Jeff Arkuss will exec produce with NHO Entertainment's Mark Costa and Ford Oelman. Comedic tale finds Radcliffe venturing to be the first male to have a successfully platonic relationship with a girl he likes (Kazan), only to find out she's already in a relationship. The production of The F Word starts Aug. 15 in Toronto.